In 1992 Graz was the first city in Europe who introduced a speed limits for the whole city: 30 km/h (18.75mph) in all residential areas / side roads and 50 km/h (31.25mph) for all priority roads - for increasing of road safety, reducing pollution, and noise. After a successful 2-year test in two 30km/h areas which was also be accompanied by research work and a year-long discussion in which several parts of the city demanded the introduction of 30km/h-zones, in 1992 and until then the unique model started. 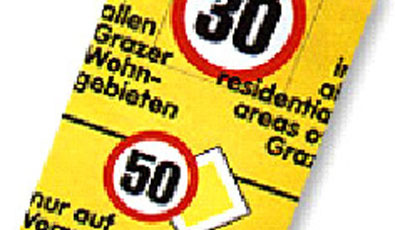 Graz was the first city in Europe to implement a speed limit of 30/50km/h for the whole city area. A 30 km/h speed-limit went into effect on all side-roads, in front of schools, hospitals thus covering around 80% of the whole city. Speed limits 50 km/h (31.25mph) for all priority (higher-ranking) roads - for increasing of road safety, reducing pollution and noise. For the priority roads a traffic-safety-monitoring group (city-experts, police, road safety board, consultants) identified dangerous spots and came up with solutions. Those included changes at programs for traffic-lights, reconstruction of roads and/or traffic-lights, reconstruction of roads and/or intersection, additional speed-limits, etc. At the most important city accesses, additional four-language info panels were installed, which draw the user's attention to the regulations applicable in Graz. Before the implementation of this measure a vast (public) awareness campaign has been carried out focusing on different levels: Level 1: Politicians and decision takers, level 2: multipliers (like journalists, priests, haircutter etc), level 3: the general public. various individual actions near intersections, such as moving banners, etc. There was a strong contra-campaign towards 30 km/h speed limit ongoing before of the implementation. The opponents claimed for a public opinion poll.>The former vice mayor of Graz who was in favour of the speed limit argued that it isn't easy for people to vote for or against a measure like this before they have seen the effects. That is why he decided to have a two years test phase. While people have been very much against the measure before it was implemented a big majority voted for 30 km/h speed limit after the two years testing period. The monitoring of the implementation “30 km/h speed limit” show that, apart from information and raising awareness, an intensive “area wide” enforcement of speed has to be carried out by police, later since 2006 also of a private speed control company* (which than handed over the task to city-own staff which is supporting the police) is necessary in order to reduce the speed level to the respectively prescribed speed. The city of Graz aims at a higher traffic safety for people using non-motorised modes of transport. The strategy focuses on the speed reduction of passenger cars, as they are the main risk for pedestrians and bikers. Wherever a 30 km/h speed limit had been introduced, the number and seriousness of road accidents could be reduced. Lower speeds bring a significant improvement in road safety conditions for cyclist and pedestrians. At the beginning when the speed limit was introduced a decrease of ca. 25% in serious accidents could have been reached. Later, when enforcement was not so strict any more the number of accidents raised again. In general it must be mentioned that ca. 80% of all accidents happen on streets where 50 km/h is allowed (which is only 20% of the overall street network). An improvement of the quality of urban live leads to a residential quality in the whole city area. A reduction on the speed can leads also to a reduction of noise (-3 dB). A regular low-speed driving mode can even reduce the discharge of noxious exhaust substances. A focus of the awareness raising activities of the city of Graz lies on the reduction of car use in favour of more sustainable modes.